Baroque works, originally written for violin, lute or keyboard, adapted masterfully by Raphaella Smits for her 1980 Gilbert 8-string guitar. Besides stage-work Raphaella Smits has made 5 LP's and 17 cd's (including 12 for Accent Records), many of them being listed as indispensable to refined music lovers. 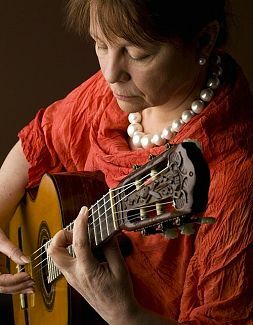 Raphaella Smits is internationally praised as an inspiring teacher for both guitar and chamber music. In addition to her chair at the Lemmens Institute in Belgium, she regularly gives master-classes in West and East Europe, in North and South America and in Asia. Organizers of international music competitions ask Raphaella as a member of the jury because of her ability to listen and to judge so accurately. Here again she shows her talent to combine professional skills with a great sense of empathy.